Two of the most common questions about MIDI conversion are "How can I convert MIDI to MP3?" and "Can I make a music CD from MIDI files?" Both are possible, but the MIDI files must first be converted to WAV files. The resulting WAV files can then be burned to an audio CD using any CD recording program, or converted to MP3 files. 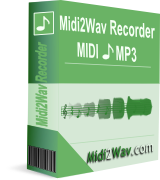 Midi2Wav Recorder is a software for Windows that enables you to convert MIDI to WAV, MIDI to MP3 and MIDI to WMA files. The conversion is as easy as one touch of a button. The software provides two ways to convert MIDI files: Soundfont Rendering and Soundcard Recording. The first method uses external soundfonts and makes conversion much more faster than real-time recording. It provides soundcard independent and silent conversion. Alternatively the second method allows to record sounds synthesized by your soundcard during MIDI playback. You can view and change the instruments in the tracks mixer, regulate their volume and balance as well as switch off some tracks. You have the opportunity to create an album of your favorite MIDI compositions performed in any tempo and key. If you want to record a song accompanied by a MIDI music then it is possible to do this as well. You may record only solo parts without arrangement and many other variants. These opportunities are often used by the music teachers creating teaching books on CD for their students. Midi2Wav Recorder gives an option to control overall level and clipping of recording while the built-in mixer lets changing volume to the desired level. The batch mode is useful for creating musical collections on audio CD. Midi2Wav Recorder looks at total duration of the chosen MIDI files and total size of the files to be converted. This allows for accurate estimating whether they will fit on one CD. With the help of Midi2Wav Recorder you can also convert any WAV file into MP3/WMA file by using different quality of compression with any accessible bitrates you may prefer. Midi2Wav Recorder has now been more than ten years in the making and we have thousands of happy customers. If you still are unsure that it will do what you want - then why not download the free Demo version and try it out?